This is a perfect example of a client who turned a not so comfortable dining room, with a very “active” mirror into her own “personal paradise.” This dining room is located in the Wealth area of the home, and was specifically redesigned to take on the opulent qualities of that sector. The purple wall, blooming flowers and richly appointed lighting and accessories make this a designer’s dream room, and will surely enhance the client’s prosperity. Dining rooms are also very important rooms in our home, because like the kitchen they represent a “hearth” or heart of the home where meals are created and shared. This represents nourishment of the body, hearts and spirit. Unfortunately in many homes, dining rooms are used infrequently only for entertaining, while the family eats in haste in other rooms of the house. Reclaiming the deeply nourishing experience of enjoying our meals in a pleasant and serene dining environment, we become more aware of the vital energy (Chi) in our food. Essential vitality is passed on to us with every meal. Although the dining room takes on the qualities of the Bagua area it is located, with art that relaxes and inspires; Waterscapes in Career, blues/greens and wooded scenes in Knowledge, floral scenes and family pictures in Family/Health, purple opulent art in Wealth, red tones in Fame, romantic art and pairs in Love/Marriage, whimsical pastels and children pictures in Children/Creativity, travel or spiritual guide pictures in Helpful People, and gold earth tones in the Center, there are other very important considerations. 1) Comfort is very important for the flow of Chi. 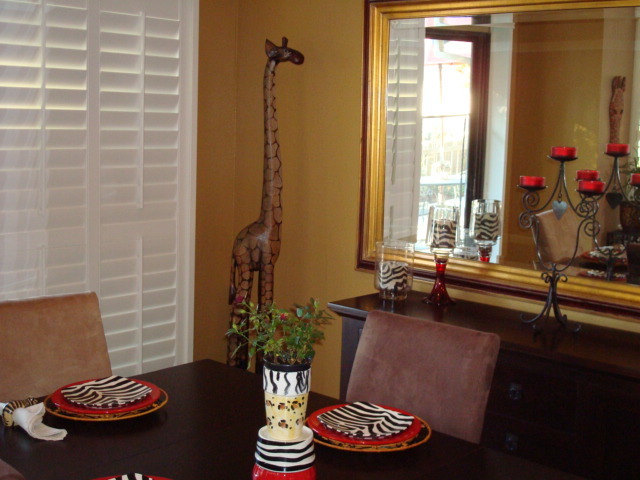 Make sure your dining room furniture is very comfortable for you and your guests. 2) Avoid protruding legs or sharp corners that would make leg placement difficult or possibly tear clothing. 3) Large mirrors are too active for dining rooms, and they tend to make guests self-conscious and uncomfortable. If you can’t remove the mirror quiet it down by placing plants or decorative objects in front. Relax and enjoy a pleasant dining experience. Chaos is part of the cycle of life. It helps us become creative, get motivated and keeps us moving forward. But chaos can also work against us, so it’s important to understand the two kinds of chaos. ACTIVE CHAOS – This is creativity at its best; a chef spinning in a kitchen whipping up a beautiful meal, a painter creating a masterpiece, a quilter cutting and sewing, a new patio being built, or a closet being cleaned. The Chi hums as new creations are forming. The key to keeping this active chaos is to clean up the mess, reorganize and enjoy the creation. PASSIVE CHAOS – This is a mess that has overstayed its welcome. It grows in piles in your office, unattended drawers, untidy closets and garages. The Chi has nowhere to flow. Passive chaos stops and drains us. The only way out is to break up the tasks in manageable chunks and tackle them one at a time. The more you let go of the old and organize, the more you attract the new.